When Troy Tanner, Olympic Gold Medalist (Seoul 1988), decided to start a volleyball club two years ago in San Clemente, he wanted to offer something different. His goal was to combine his love of volleyball with his Olympic and collegiate level coaching experience. As a result he formed the Tstreet Volleyball Club, named after his favorite family beach. Tanner’s longtime friend and teammate Karch Kiraly was watching. Karch’s legendary playing career was just winding down, and making the transition into coaching the Tstreet V.C. alongside Troy seemed like perfect timing. After having a great time coaching his son’s high school volleyball team he has never looked back. Headed into its third year, T-street’s philosophy seems to resonate with a lot of people as the club went from eight girls in 2007, to 43 girls in 2008. Add to the mix a new partner in Karch Kiraly, the addition of boy’s teams, and there is little doubt that ’09 will be another big year of growth for the club. Tanner is ecstatic to bring Kiraly on board, and who wouldn’t be? Karch is recognized as the premier volleyball player in the history of the game. Tanner and Kiraly have a long history together as teammates on the ’88 Olympic team and competitors on the AVP tour. Interestingly, the duo will also be working together at the Beijing Olympics as Kiraly does the commentary for NBC’s beach volleyball coverage, and Tanner coaches the #1 seeds Kerri Walsh and Misty May. Most importantly for Tstreet, they share goals for the future of their club. “We’d always talked about having a gym full of well rounded volleyball players having a good time,” states Tanner. Some enjoyment, according to Kiraly, comes from mixing things up and getting out of the gymnasium. “We feel that it’s important to include beach volleyball into the practice rotation. Growing bodies need a break from hardwood. 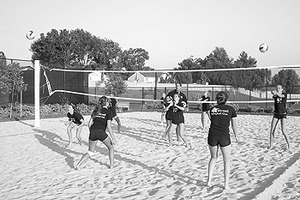 Playing in the sand (especially doubles), improves ball control and the weaker parts of any player’s game. There’s no hiding in doubles,” according to the three-time Olympic champion (one gold in the sand, ’96 and two indoor, ’84 and ‘88). Tstreet is ahead of the curve in getting girls on the beach, where Tanner and Kiraly agree that despite the sand being tougher to move and jump in, it strengthens joints without all the jarring on the body. They are not at all surprised by the growing trend in colleges throughout the country to have girls playing outdoor ball in the off season - a major taboo in years past. The duo’s passion to develop well-rounded players is most evident in the club policy for the 12s and under teams. “We feel that the younger players need to play every position, there will be no specializing” says Tanner. Kiraly and Tanner feel this policy will increase a player’s confidence in every skill and develop a high volleyball IQ. Another consistency in their coaching philosophy is that practice time is precious and it’s crucial for coaches to plan ahead. “All of our coaches must be prepared, and will be implementing Olympic level drills and practice formats,” insists Kiraly. Karch and Troy are both adamant that their drills must be designed to keep all participants moving, learning and touching as many balls as possible. You won’t see Tstreet boys or girls standing around, they admonish. For more information you can visit Tstreetvolleyball.com.